By now with everything the families of the Buslee crew had all been through together, they considered each other friends. Not a happy friendship, but one brought together by sadness and loss. More of a family, really, as their loved ones were as close as brothers as they served their country in WWII. Raleigh Mae Farrar hadn’t received a letter from one of the crews’ families in many months, but in November 1945, Gerald Andersen’s wife took the time to write. I have wondered so many times if your son S/Sgt. Geo. Farrar has gotten home after I received word from you that he had been released from prison Camp. I have been so in hopes that he could give us some information. I received the following information from Quartermaster General, Washington, D. C. concerning my husband’s burial. I do hope your son is in good health. Was he near this Cemetery? I am trying to contact someone in the Occupational Forces, to visit the cemetery and get pictures of a same. I am teaching again this year. The time passes and when you are busy you don’t have time to think. I would appreciate very much to hear from you and to know if your son has come home. 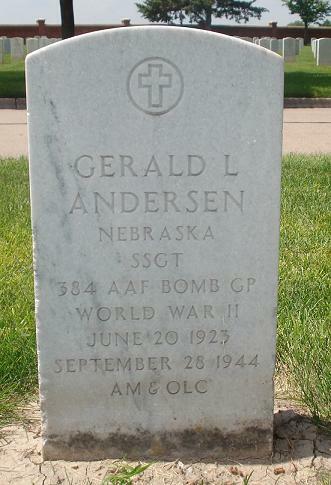 Gerald Andersen has since been reinterred in the Fort McPherson National Cemetery in Maxwell (Lincoln County), Nebraska, Section F, Site 1229. Gerald Andersen’s wife said so much with so few words in her next letter to George Edwin Farrar’s mother. Andersen and Farrar were Buslee crewmates on the Lead Banana when it was involved in a mid-air collision with Lazy Daisy on September 28, 1944. Andersen was the crew’s tail gunner, and Farrar was the waist gunner. Mrs. Andersen must have received a telegram around March 24, 1945, almost six months after the collision. 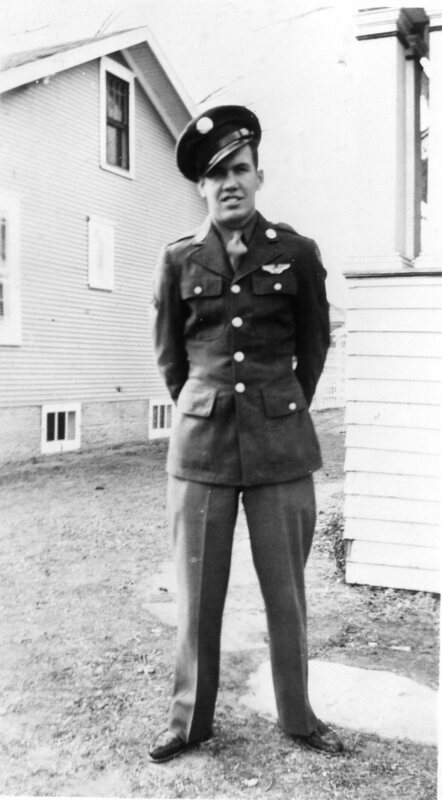 Farrar’s family had found out he was a prisoner of war on December 31, 1944. The rest of the families of the boys on the crew had either found out their sons were killed in the collision or were still awaiting word. Farrar was the only reported POW. Mrs. Esther E. Coolen Andersen was numb and could not believe the news that her husband was dead. Her strong faith had been shaken. She relayed the same message as other families. She was anxious for Farrar to return from the war so that he could tell what happened, how her husband died. She thought that knowing would bring relief and comfort. I have been so numbed by my news I have neglected all my letters, which was a mistake because friends can help so much. I have had such strong faith and trust Gerald was coming back that I can’t believe my message. How glad I am, one was spared so we may know what happened that terrible day. It will bring so much relief and comfort to us when we know. I am so happy for you. You have heard from George and been able to send things to him. We hope your son will soon be released, if he isn’t already. It has been so hard to take the last 2 weeks. I have been receiving my husband’s medals. He never cared for honors, all he thought of was helping with this and getting it over as soon as possible, like so many others, so we may have our home again. The best of luck to you and may you soon have good news. I am sending a snap shot of my husband.